A gift she’ll never forget. 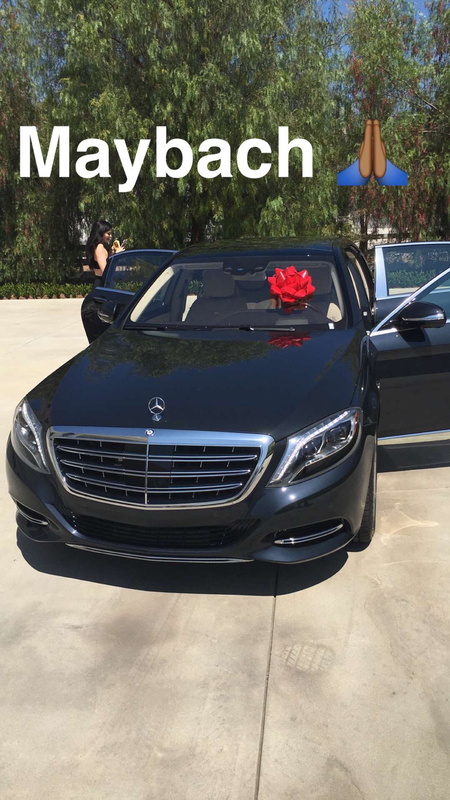 Tyga gave his girlfriend, Kylie Jenner, a $200,000 Mercedes-Benz Maybach as an early present for her upcoming 19th birthday. The “Ice Cream Man” rapper, 26, shared photos of the luxurious black car — topped with an oversize red gift bow — on Snapchat on Saturday, August 6. The makeup maven also gave her followers a peek inside the car, sharing a photo of the beige interior from the backseat. “Almost too boss for me,” she captioned a Snapchat pic. The Mercedes-Benz Maybach isn’t Jenner’s only new set of wheels. Earlier this week, she treated herself to a custom Land Rover SVAutobiography to ring in her last year as a teenager. “My new car! This is one of a kind!” she told her fans in a Snapchat video on Sunday, July 31. The Keeping Up With the Kardashians star’s new rides aren’t the only ones sitting inside the garage of her Calabasas, California, mansion. She already owns a Mercedes-Benz G-Wagon, a Rolls-Royce Ghost and a Ferrari, which Tyga gave her last year for her 18th birthday. “It’s probably way too many cars for a young woman, but I love them and I love cars, so it is what it is,” the reality star said of her many cars in a November 2015 video on her website.